Let Roofworx Help With Your New Roof Installation Today! With all roofing structures, the overall goal of a roof is to act as protection against the elements, and to prevent water and other precipitation that can gather on top of a roof. Typically built as a flat slope roof, commercial roofs and repairs have undergone significant changes in how they are maintained and serviced, from simple inspections to full-on replacements. Does your office need a quality, professional service? There are several commercial roofing options available, whether you are looking for a new roof or needing simple repairs. Contact us today 817-920-5974 to speak to a roofing expert for your commercial roofing in Fort Worth and Dallas, TX. Roof Replacement A roof replacement service is ideal for commercial properties whose roof has suffered extreme damage and cannot be repaired. Flat Roof Repair Most commercial properties have a flat roof and need repairs over time to prevent against water and damage. TPO Cost efficient, chemically resistant, and an easy installation make TPO roofing a highly recommended rubber roof for commercial spaces. PVC PVC roofing requires less maintenance that its rubber roof counterparts, and is made of extra plasticized components that strengthen the overall roof. EPDM An extremely durable, sought-after rubber membrane used for flat roofs, known to withstand extreme temperatures and is water resistant. Built-up Roofing Customized based on preference, built-up is composed of alternating layers of modified and reinforced fabrics to create a membrane. Modified Bitumen The alternating layers that make up the modified bitumen membrane are melted together to help stop and prevent leaks, making it seamless. Is your commercial roof in need of serious repair, or unable to withstand additional damages? Contact us today 817-920-5974 to talk to us about commercial roofing at Roofworx & General Contracting in Fort Worth and Dallas. Acrylic Water based coating that can stand against weather and physical damage, acrylic coatings are installed in two coatings to provide full coverage. Roof Re-Coating If you’ve undergone a roof repair, you may need a roof re-coating to give the exposed parts of your roof extra coverage against the elements. 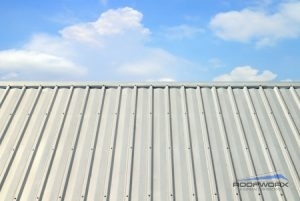 Metal Roofing Able to withstand most climatic conditions, a metal roof can be installed in large sheets, is lightweight, fireproof and water resistant. Does your commercial property need a new roof? Have you noticed damage over time and are needing experts to help repair it for you? Let the experts at Roofworx help you with your commercial roofing problems, give us a call today 817-920-5974 to talk to our professional roofers and get a free estimate. We are available for commercial roof services in Fort Worth and Dallas, TX. Updated on February 11, 2018 at 7:41 am by Roofworx & General Contracting.